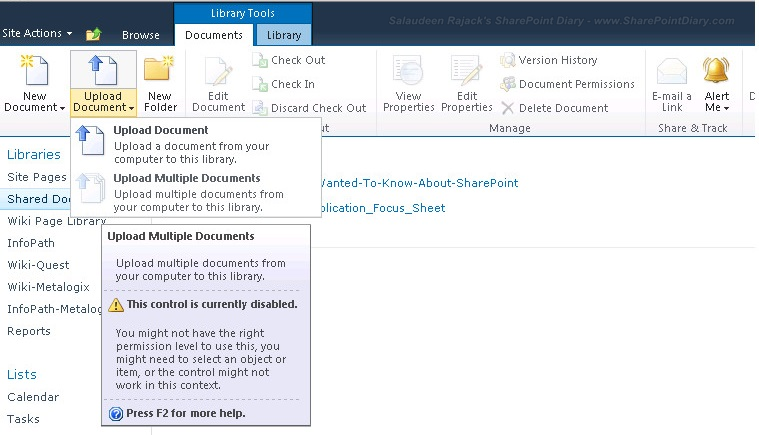 Home Known Issues SharePoint SharePoint 2010 Upload Multiple Documents, Explorer Views Disabled or Missing in SharePoint? Upload Multiple Documents, Explorer Views Disabled or Missing in SharePoint? Found Upload multiple documents and Explorer views are disabled (in some cases, they are missing!) in a SharePoint 2010 site! IE security setting may blocked the STSSYNC ActiveX add on - Enable it from "Manage Addons" in IE (check for STSUpld UploadCtl Class. Disable the IE ESC if enabled! Check the path of the folder in which you are trying to upload. It should not exceed the 256 character limit.